Mobile video surveillance provider AngelTrax debuted a powerful new tool for fleets of any size — the new MotoTrax™ Driver Behavior feature, designed specifically to help fleet managers instantly identify their riskiest drivers in real time. Driver Behavior is the most advanced in an impressive array of features in MotoTrax, the AngelTrax online surveillance manager. This optional feature equips transportation directors with the data and analysis needed to pinpoint the drivers and behaviors that can cost the company the most in insurance, litigation and maintenance. 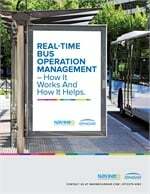 Live, in-browser scoring can be accessed securely from any location with an active Internet connection, providing real-time vehicle, group and fleet comparisons. 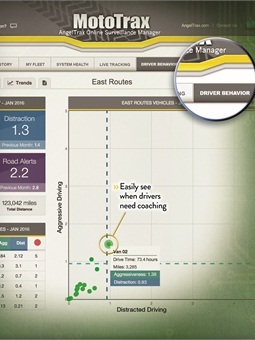 Fleet directors can now administer stat-driven driver coaching with undeniable video of the incident and the moments prior. Video clips correlating with event alerts are downloaded directly to your computer, to reveal the cause and effect of hard braking, swerving and other aggressive or distracted driving habits. "Instead of relying on a third party to send you only the video clips they think you ought to see, you now have access to every video clip tagged with an event marker," explained AngelTrax President/CEO Richie Howard. "When a fleet manager is coaching a driver, showing the actual video of their own driving habits can make all the difference between an OK driver and the new safest driver in the company."